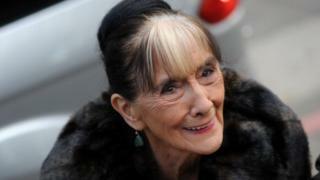 EastEnders veteran June Brown has said she can no longer recognise her friends as she deals with age macular degeneration at the age of 92. The actress, who plays Dot Cotton in the BBC One show, says she has lived with the condition for 10 years. The sight-losing condition is common and can first affect people in their 50s and 60s.Speaking to the Daily Mirror, Brown said she has no central vision at all and can no longer respond to fan mail. "I haven't driven for years and I can't really go out socially due to my eyesight," said the actress. Brown has starred in EastEnders since 1985 and revealed in 2018 that this will be her last year on the show. The actress said her condition was getting worse despite undergoing eye surgery in 2017. "I never go to soap awards or suchlike now." she said. "I don't recognise people that I know and they would think I was snubbing them. "Just pray for your health and strength, hearing and eyesight, and an active mind," she added. Age macular degeneration (AMD) is a common condition which usually starts to affect people in their 50s and 60s.Although it does not cause total blindness, it can make everyday activities like reading, watching TV and recognising faces very difficult and can worsen without treatment. Symptoms can include seeing straight lines as wavy or crooked, objects looking smaller than normal and seeing things that are not there. The exact cause of macular degeneration is unknown, but it has been linked to smoking, high blood pressure, being overweight and having a family history of the condition. There are two types of age macular degeneration (AMD), dry AMD and wet AMD. There is no treatment for dry AMD but vision aids can help with day-to-day life. People diagnosed with wet AMD may need regular eye injections.